Pate a choux, pate a choux, pate a choux. I had a sneaking suspicion that when I finally tried you, I would fall in love, but truthfully, I never could have guessed to what extent. My only regret is that I waited so long. Pate a choux is featured in the current issue of Donna Hay – my favorite Australian import. This prompted me to finally try my hand at the pastry responsible for so many little puffs – errhhh appetizers and desserts. Unfortunately, whether it is to be blamed on my poor job of translating grams to tablespoons or simply that my kitchen is in the northern hemisphere, my first attempt did not turn out well. 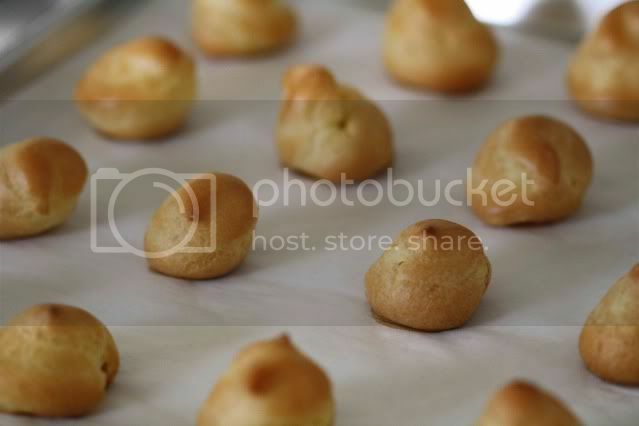 The pate a choux didn’t rise due to too much butter and the resulting mounds looked more like discs than puffs. I knew I could trust Michael Ruhlman and his ratios for try number two. 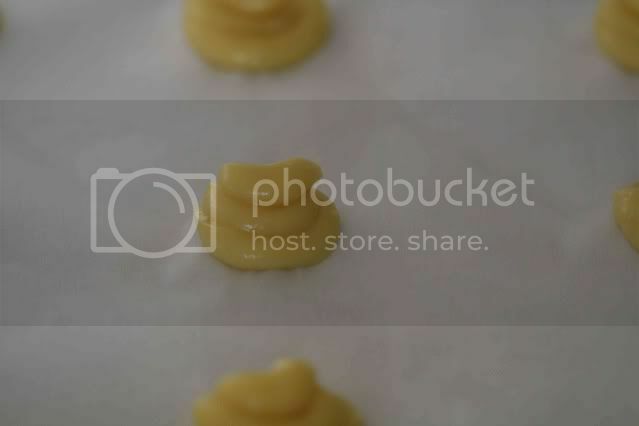 Pate a choux is a simple formula of 2 parts water to 1 part butter, 1 part flour and 2 parts eggs. Following this formula resulted in a perfectly puffed pastry on the first try. Pate a choux is not entirely delicious and enticing on its own. Its job is to serve as a blank canvas for whatever fillings – both savory and sweet - you can come up with. For my first go round, I decided to stick with a classic cream puff. I filled the pastries with store-bought pastry cream and drizzled homemade dulche de leche over the top. My taste testers were in love as well. They demanded more pate a choux as soon as possible. I complied with a savory version that is apparently the best thing I have ever made – at least according to one taste taster. More on that soon. For now, I highly recommend you take a stab at pate a choux - if you haven’t already. Place the butter and water in a medium saucepan and heat over medium heat until the butter is melted and the liquid is simmering. Add the flour and stir vigorously with a wooden spoon until the dough pulls away from the side of the pan. Transfer the dough to a stand mixer fitted with the paddle attachment. Add one egg at a time, making sure each egg is fully incorporated before adding the next. You can mix the eggs in by hand, in the same pot if you prefer. Place the dough in a piping bag with a plain tip or a large Ziploc bag with one corner cut off. Pipe the dough into 1-inch diameter mounds on a baking sheet lined with parchment paper and place in the 425 oven for 10 minutes. Lower the heat to 375 and continue cooking until fully cooked - about 20 more minutes depending on the size. Just look for them to be golden brown all over and you’ll know you’re done. Once they’re cooled, what you do with them is really only limited by your imagination. I filled mine with a store-bought pastry cream and topped them with homemade dulche de leche. These are very cute little desserts. Like you I feel I've gotta try them now. Especially with the opportunity to use a piping bag. I have always been afraid of pate a choux! This method makes it look pain-free -- and you're right, just a great blank canvas for whatever else you want to do..... 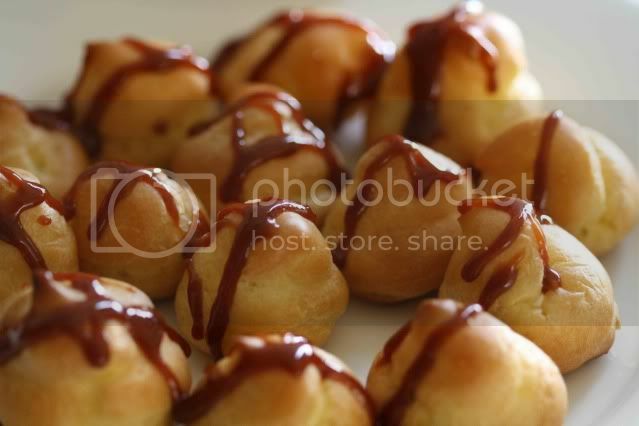 I've always wanted to try making profiteroles (ice cream-filled pate a choux)! I also love the magazines of Donna Hay!! yeah! I so love these desserts!! Yummie all the way!! Beautiful! I've made pate a choux once--I made gougeres which were delicious. Never made them in sweet form though, but this recipe is inspiring. I'm planning to make your dulce de leche this weekend, by the way! Bless you for not including metric measurements, oh the translations! These are great party stand-bys, thanks for the reminder. I think I'd fill mine with marscapone and lemon zest for an occasional desert switch from dulce de leche. I've always wanted to try making this! Yours look perfect. Oh sweet memories I used to make these for my Grandma for her birthday. Those do look delicious! Pastry seems tricky though. Don't know why. They look perfect! I love that you made them so small. I think I drooled a little when I read the 'dulce de leche' part! Have always been a bit scared of making this type of pastry but it seems totally worth the effort! These look delicious. I'm afraid to start another addiction but I can't wait to try them. These look picture perfect, almost too good to eat.